Long before the days of Land Rovers with padded seats, Africa was experienced on foot. Men would hike for days or weeks deep into “the bush” for close encounters with fearsome beasts. The animals of the Big Five (the lion, the leopard, the rhinoceros, the elephant and the cape buffalo) received that honor because they were the most dangerous to hunt on foot. Today, by leaving the safety of the vehicle and experiencing Africa on foot, we can replicate some of that experience and appreciate the bush the way it was meant to be – up close and personal, with elements of thrill and danger. When we were planning our trip to Africa, we knew we wanted to do some kind of walking safari experience. 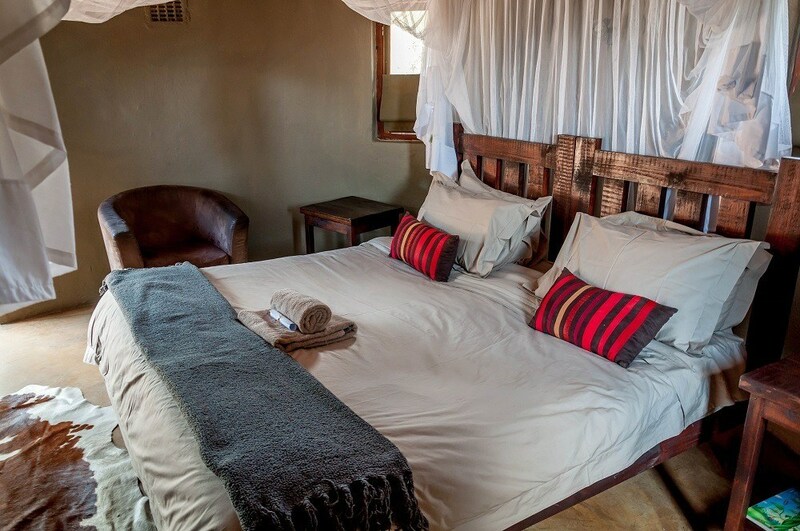 It was important to us to experience Africa in the most rustic and authentic way possible. Africa on Foot was just that experience. 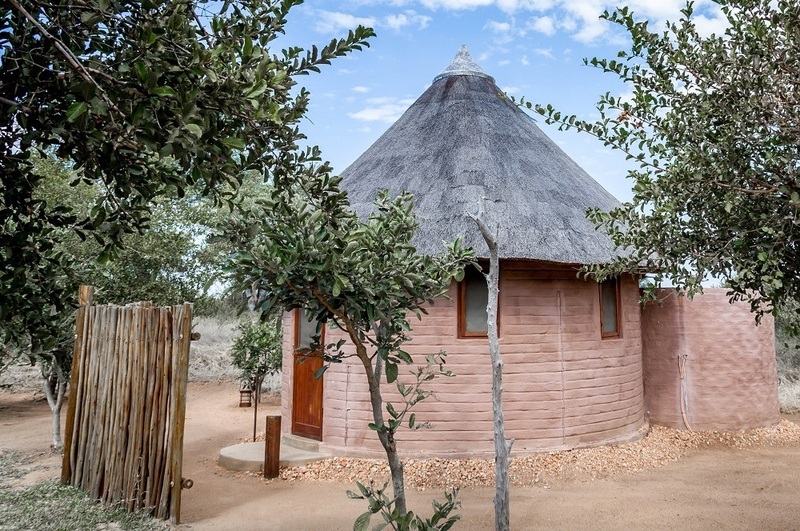 The camp is rustic and off-grid, minimizing its impact on the land and blending into the local ecology. 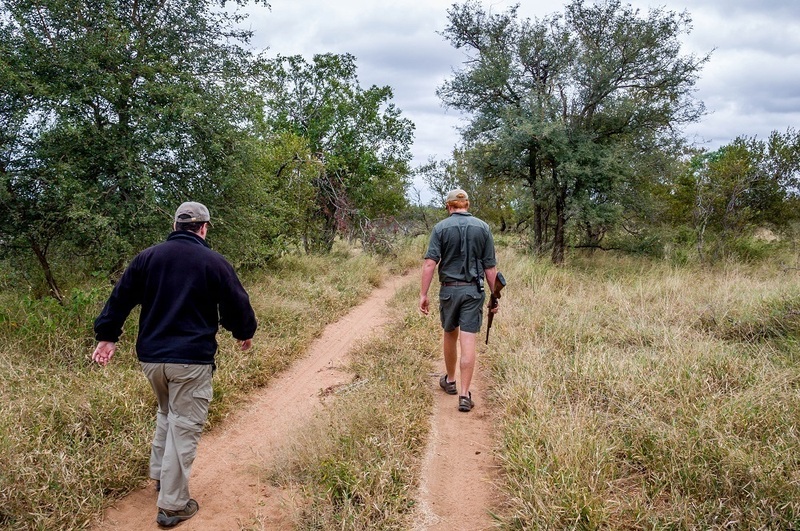 The Africa on Foot safari camp focuses on the traditional walking safari – a four-hour early morning walk taking in the vastness of the African wilderness. In the pre-dawn blackness, we awoke with our guide, Faffa, banging on the thin wooden door of our rondavel (a traditional African hut with a thatched roof). Since Africa on Foot is based on solar power, electricity is conserved. Our room had a little glass bottle with a solar battery powered light, which cast an eerie blue LED glow throughout the room. We dressed quickly and hustled out into the cool air. Upon opening our door, a brisk wind pushed softly on our faces. Faffa met us by the Land Rover and explained that there was a change in plan – we would be taking a game drive instead of a walk. Strong winds can be lethal in the bush. The wind masks the subtle noises of an animal moving through the grass or rubbing against a bush, but it also carries scents. On windy days, there is a much greater chance of an animal surprising you, or you surprising it – that situation doesn’t usually turn out well. It was a stark realization that we could be ‘in harm’s way’ in a matter of moments. So we boarded the Land Rover for the first of several game drives at Africa on Foot. 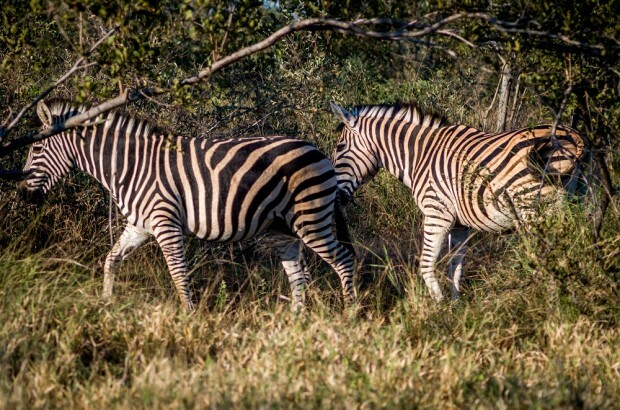 We would eventually see all of the Big Five during our game drives. But, true to the premise of Africa on Foot, our guide Faffa promised us walking safaris and he delivered. 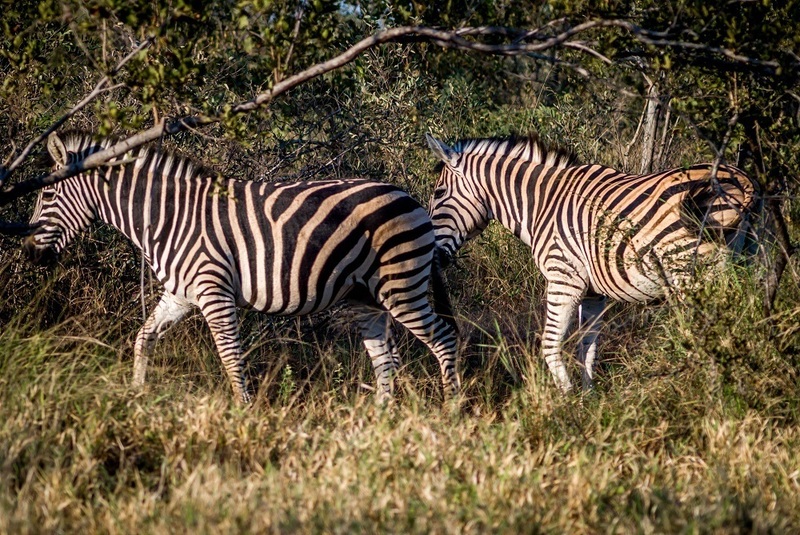 We were able to get in two great safari walks during our time in the Klaserie Private Nature Reserve. It really is astonishing how different the bush feels at ground level compared to just a few feet up in a Land Rover. It sounds silly, but anyone who has walked in Africa will likely agree. Perhaps the most curious creature we encountered was the Processionary Caterpillar. They form these long, single-file chains as they march from shrub to shrub. I’d never seen anything like it. Elephants are known to drink from the pool! 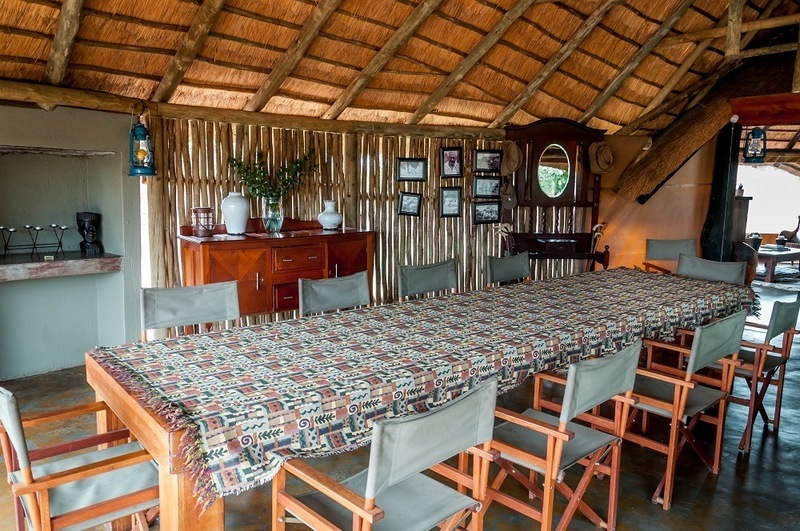 And after every safari, we return to our camp to relax. After the morning drives and mid-day walks, we had the time to lounge by the pool or curl up with a good book in the large chairs. 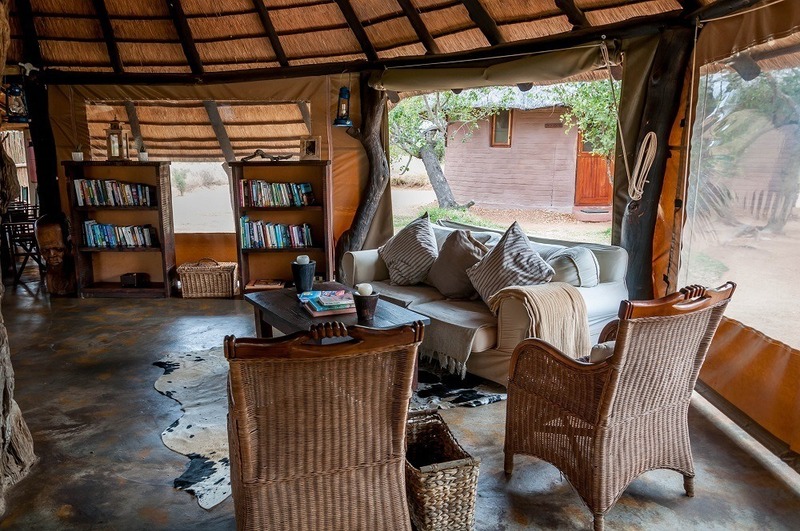 The camp just lends itself to relaxation and I will confess to taking a short nap when I should have been reading! Did I mention that the rondavels have outdoor showers? We found that afternoons were a great time to take a cool refreshing shower and gaze out at the trees. You never know when a giraffe might wander by. I haven’t had an outdoor shower since summer camp as a kid. The evening game drives proved to be the most exciting. In the pre-dusk hours, the bigger animals (elephants, lions, giraffes, and rhinos) would be out feeding. We could get up close and very personal with these magnificent animals. Around dusk, we would stop for the sundowner – a break to have a glass of wine and sample the local South African biltong (sounds like “bull tongue”). Biltong is a spiced, cured meat similar to jerky. 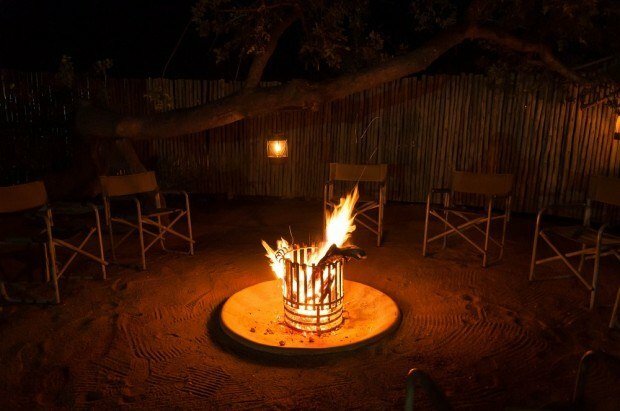 After the sundowner, we continue our safari looking for nocturnal animals like porcupines, hyenas, and galagos (bush babies) – their eyes glowing a bright green as they reflect the light. Our evenings concluded with a pre-dinner cocktail in front of the fire. 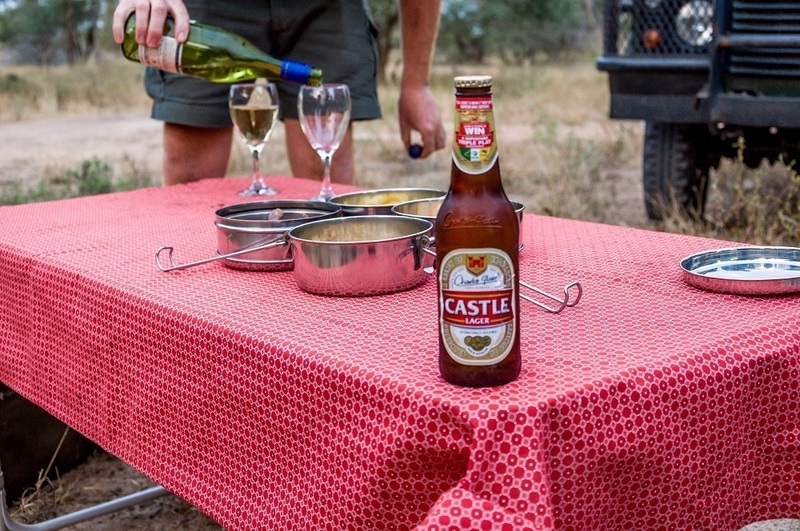 Dinner at Africa on Foot is a relaxed experience. We found ourselves chatting with our guides about the days game drives while enjoying delicious meals of beef filet or a pleasing concoction known as “sticky chicken.” All of the meals were served with a heaping salad and vegetables. The food was excellent! If a picture is worth a thousand words, then a video is worth a whole encyclopedia. 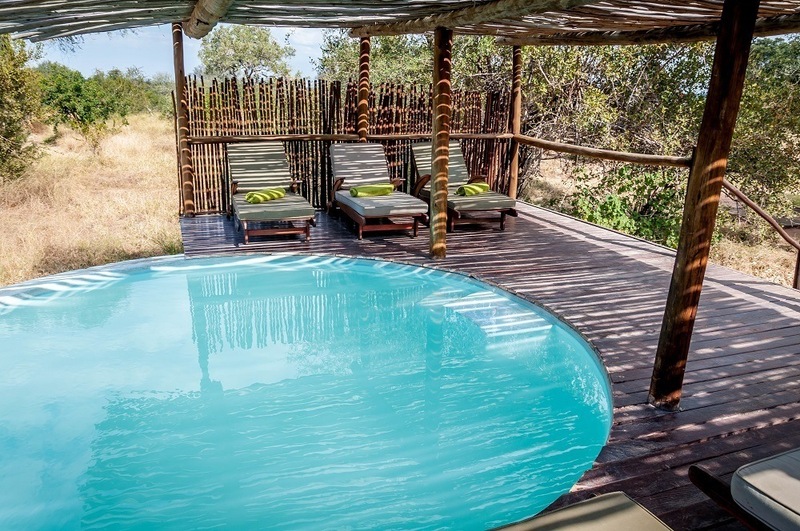 One cool thing they offer is My Africa – a personalized video safari experience (pre-booking required). We really didn’t know what to expect, but I think you’ll agree, it’s amazing! When I thought about going on safari in Africa, I had an image in my mind. That image revolved around viewing animals and being pampered in a relaxed atmosphere. If I could have drawn a picture in my mind about what our safari experience would look like, I would have pictured Africa on Foot. We were guests of Africa on Foot. As always, all opinions are our own. Top 10 UNESCO World Heritage Sites to Visit Picking a Park on the Riviera Maya — Xcaret or Xel-Ha? 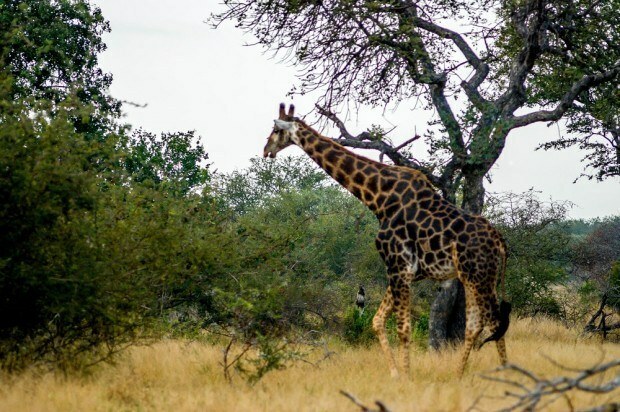 What do you think about Experience Africa on Foot – A Safari Adventure? Wow – this sounds SO amazing. I’d love to do that! And, the lodging? Beautiful! If it weren’t for the sounds of the animals and the stunning views, you’d be hard press to know you were in the bush. We loved it! Wow this looks so amazing I would love to do this. I know I’m supposed to be excited about the animals, but all I can see is that pool! Take me there NOW! Thanks Alex. Truth be told, the pool was pretty cold (we were there in the winter), but I did take a dip. But in warmer weather, it would be fabulous! I still haven’t been to Africa but it’s on my list! I’ve just been waiting to do it properly like you have. I really like the approach Africa on Foot has, could be a great company to go with. I hope you get the chance to go. We knew we walked to do the walking safari and experience the bush at ground level, but were also kind of apprehensive about it. We’re so glad we had the experience. If you go, you’ll have to let us know about your experiences. This makes me miss Africa so much! I only did one quick safari trip in Kenya when I was there, but I fell in love. You really capture the experience so well. What a great camp! The open air shower reminds me the ones I used when I was in Gambia, in NW Africa. Sounds like an interesting company! I haven’t done the official safari in Africa yet but ran into many animals whilst driving on the sand dunes for 5 days. Would love to stay near the animals so I can see them in natural setting like this. Looks great! I think both Franca and myself would have loved to have joined you during the drive, especially given the great time you had as shown with the video. Wow that looks amazing. I’m in the early stages of planning my safari for next year and I will definitely be keeping this in mind when I get closer to making decisions. I love the outdoor shower! 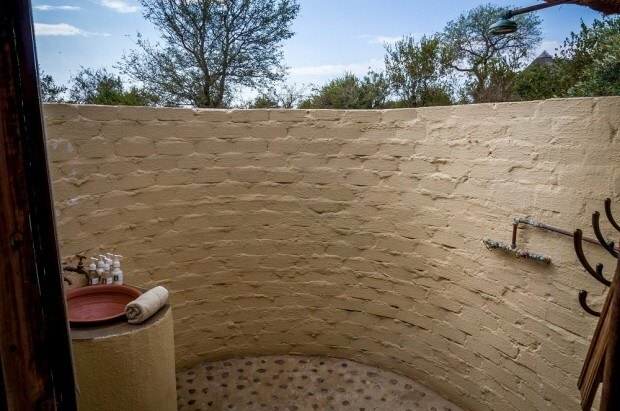 We loved our experience, outdoor shower included!